In 1981, when Tom Doornbos died, he left an estate valued at more than $333,000. This confirmed one of the most enduring legends about Doornbos, that this reclusive Dutchman, who lived for forty years in shacks in Yellowknife (map) , was actually a wealthy man. Born in Holland on December 20, 1890, Tom Doornbos immigrated to Canada during the Great Depression and wandering from job to job eventually ended up in Yellowknife in 1941. It was during the mid-1940s that Doornbos became well known in that isolated northern mining town as the man who supplied Yellowknife households with pails of water. 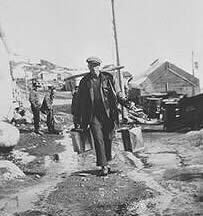 At two-bits (25¢) a pail – carried two at a time suspended from a yoke across his shoulders – it’s said he earned enough money to begin buying property in Yellowknife’s Old Town. At his death he owned thirteen lots valued at more than $289,000. Over the years Doornbos’ frugality took on legendary proportions. Stories have been told of how he would order hot water in a restaurant and mix in ketchup to make tomato soup or how he would search through garbage cans in Yellowknife’s back alleys when he needed new boots or pants. Whether true or not, these stories of a wealthy hobo wandering the streets of Yellowknife were often repeated. It was only during his final years living in Yellowknife’s senior citizens home that Doornbos had a proper roof over his head. He was then, in the 1970s, a familiar sight on Yellowknife’s streets. Stooped over his cane, he would make his daily rounds between the library, the post office, his favourite café and his single room in the senior citizens home. Doornbos Lane, a street in Yellowknife’s Old Town near the location of Tom Doornbos’ first shack, was named by the City of Yellowknife honouring one of its most colourful citizens.